A 160,000 gallon oil spill near Galveston, Texas is delaying cruise ships coming and going to the cruise port, including Royal Caribbean's Navigator of the Seas. The collision between a barge and another vessel Saturday near the Texas City Dike spilled 160,000 gallons of heavy oil into Galveston Bay and has forced the U.S. Coast Guard to close the Houston Ship Channel. Royal Caribbean's Navigator of the Seas was scheduled to arrive early this morning and let off its passengers while allowing new ones to board but it remains stuck outside the harbor. Passenger Jonathan Spoon is aboard the ship and told the Galveston Daily News, "We are being told they are conducting a flyover to see if the ship can make its way into the port (of Galveston) without going through the oil. There are lots of ships parked all around us. So far no problems on the boat." 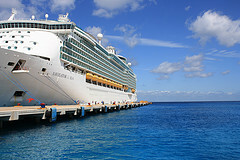 He said Royal Caribbean reopened many of the ships restaurants and onboard activities to keep the passengers comfortable. Royal Caribbean has not commented on the situation yet, but is monitoring it.